West Indies thrash England by 381 runs in the first Test and then destroy them by ten wickets to reclaim the Wisden Trophy with one Test to play. Certainly not me. I had forecasted 2-0 or 2-1 for England notwithstanding their poor Test record in the Caribbean (just one series win in 51 years). After looking so inept in India and Bangladesh at the end of last year – losing all four Tests inside three days – this seemed the ideal opportunity for the English to vanquish the former kings of the game and get their big year of 2019 (World Cup and Ashes to follow) off to a rousing start. “A fluke” might have been much of the reaction to the West Indies’ first Test demolition of England, never mind how comprehensive that win was in Barbados. Now that they have done it again though, and in arguably even more impressive fashion, many may even be daring to ask if this is the beginning of the long-awaited turnaround? Too early to say, although it’s fair to add that the signs have never been more encouraging. Yes, England were complacent. Their build-up to the first Test was ample evidence. And yes, there is a thread of arrogance running through the fast-fraying fabric of their failed campaign if you read between the lines of what everyone – captain, players, coach, media – was saying before a ball was bowled and what they have continued to say in the seven days of Test cricket before the finale in St Lucia which have shown a West Indies with more resilience and resolve than almost anyone expected. Much of the attention has focused quite rightly on how well the fast bowlers, led by the superb Kemar Roach, have exploited the favourable conditions much more effectively than the English, who were so delighted with the Dukes balls being used for the series and how prodigiously it swung that the pre-series propaganda left you fearing for the West Indies managing to get three-figure totals in any innings. What those two Tests have also shown, and this is something that has been talked about for a long time, is that we have been fooling ourselves and digging our own cricketing graves by preparing these slow and low pitches year after year in the belief that we weren’t good enough to match or better the quality of the opposition’s fast bowlers. Another aspect to that view is that our batsmen were so poor, based on their records and the generally abysmal standard of the regional game, that they had to be protected from the likes of James Anderson and Stuart Broad by serving up the sort of lifeless tracks which would at least give them a chance of survival. Well, look what happened at the Sir Vivian Richards Stadium on a pitch as green as last year’s against hapless Bangladesh but even more venomous due to confidence-sapping variable bounce. England were bundled out for 187 and 132 in a combined 103.1 overs. West Indies occupied 131 overs in grinding their way to 306 and a first innings lead of 119, an exercise in discipline personified by Darren Bravo’s even 50 off 215 balls and 342 minutes, the third slowest half-century in 142 years of Test cricket behind two Englishmen: Trevor Bailey (350 balls, 357 minutes) and Chris Tavare (236/350). Whether it was his double-failure in the first Test or a sense of belonging based on the team ethos developed by admirable young captain Jason Holder, Bravo played as the team required. Bare details on a scorecard record the effort as just another half-century. But in the context of the match, the conditions, the suppression of his inherent flamboyant style and his return after more than two years in the wilderness, this innings must rank as the most significant he has played in his cricketing life. In his case that innings was a definite transformation. As for team turnaround, well, only time will tell. 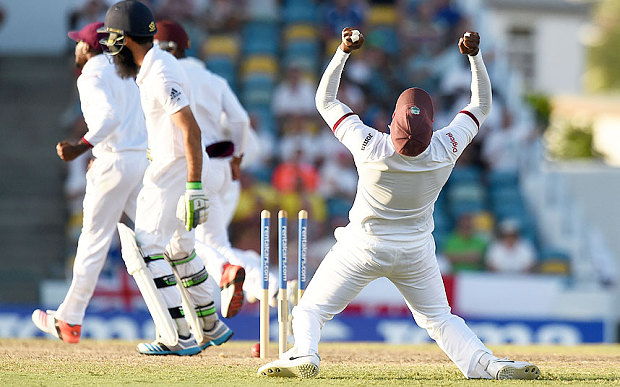 Another talking point developed in the aftermath of the second Test when it was learnt that Holder would be suspended for the series finale due to yet another over-rate infraction by his team, prompting a number of prominent personalities in the game to condemn the over-rate policy, especially as the West Indies won inside three days. But these are the rules. Making noise after the fact is just populist hot air. If it was felt to be unjust, this should have been opposed by the Cricket West Indies representatives at the International Cricket Council a long time ago, especially as it was quite obvious that the over-rate requirement, preceded by the one bouncer per batsman per over rule in the early 1990’s, was prompted by the extent of Caribbean fast bowling dominance. It was so shamelessly blatant, yet West Indies strength on the field then was not replicated by strength of conviction in the boardroom in objecting strenuously to the new limitations. So all the lamentations ring hollow and only distract from an outstanding team performance, the likes of which no-one outside the team, and maybe some even within it, really expected.